Sunday was like no other day I’d see this summer. It was derby day! 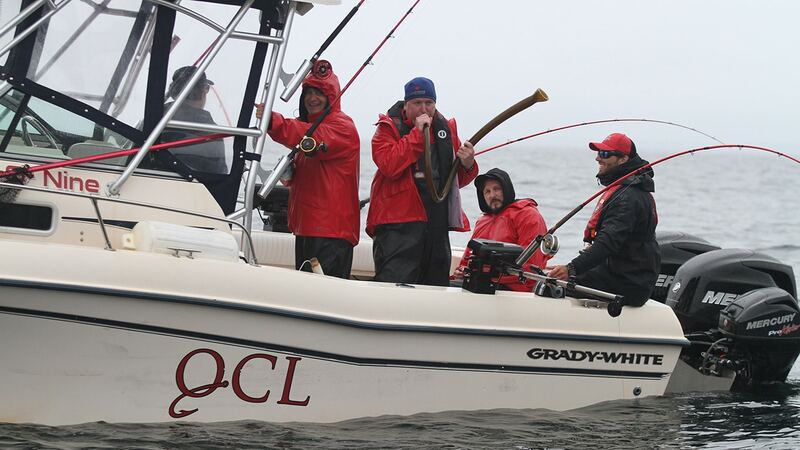 Not only was it derby day, but the final day of the prestigious Kingfisher Salmon Classic. The weekend had been moderately slow due to a couple of pods of orcas cruising throughout the fishing grounds. This made for an extremely interesting derby, leaving no Grand Prize out of reach. On Sunday we decided Bird Rock ll was going to be the home of the hog we were hunting. In my boat there seemed to be no additional pressure from the derby. The boys were enjoying cold beer and talk radio all morning. Our only issue was that the last ten consecutive Chinook releases were between 10-15 lb., which was a pretty good problem to have! Unfortunately, that size of fish was not going to move us up in the rankings anytime soon. After meticulously carving up a couple of cut plugs, I weaved my way through the fleet of red and white boats. Hugging the wall of B2 I had a feeling there would be a nice fish sitting deep in the east bay. As the ebb tide helped me swing my gear into the strike zone I saw our first derby-worthy take. This fish was off the clip and heading straight for the kelp! We were fortunate enough to cut him off just in time, and after a solid 10-minute fight he was in the bag. Not soon enough either, as I pulled the net away from the waterline, a massive bull sea lion attempted to steal our fish. Not this time though, which felt good considering he obliterated a couple of our salmon earlier that morning! After a quick hand off to the derby marshall, we decided this fish was going to be entered in the “kill” category. A 22.3 had been leading the weekend. A few chewed nails and empty beer cans later, we got the verdict… our 22.6 was the new leader! We managed to hold on to the title throughout the evening tide. Back to the Bell Ringer boys, we got him! Thanks for reading, tight lines and silver smiles!